Many patients with restricted mobility may find it difficult to transfer themselves in and out of bed without assistance, leading to a loss of independence and a drain on carer time. The Sidhil Elland Bradshaw Bed Grab Handle allows patients to provide that assistance to themselves, and is designed to be used with any of the Bradshaw beds with fitted wooden side rails. The handle is positioned on the inside of the side rails so the two aids do not compromise the other's performance. This Bed Grab Handle is simple to attach to the framework of your bed or profiling bed, and can be clamped on in seconds without the use of tools. Fastening easily with the included hand wheels for tightening, this handle provides a great deal of independence and assistance with a minimal amount of staff time dedicated to setup and attachment. Carers of patients with low levels of mobility can often spend a lot of time helping them in and out of bed, hurting their ability to provide adequate care in other areas. 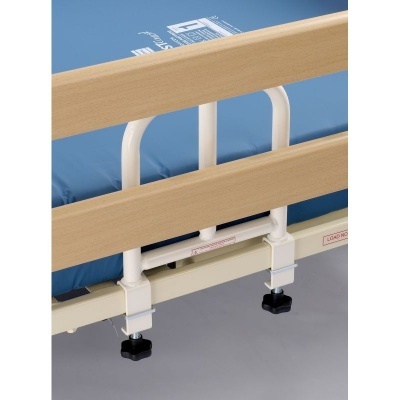 By increasing the independence of the patient, this Bed Grab Handle can help provide carers with more time to complete other tasks while the patient safely enters and leaves their bed independently. Please be advised that the Sidhil Elland Bradshaw Bed Grab Handle is usually delivered within 1 week of your order being placed. We would advise you to consider this delivery estimation before placing your order. For more information, please contact our Customer Care Team at 020 7501 0592.